ScanExpress JTAG Programmer is a universal in-system programming (ISP) solution designed for convenience and versatility—a modular, multi-functional, and high-performance tool to program, read, and verify Flash memories, serial EEPROMs, CPLDS, FPGAs, and more. Like all Corelis ScanExpress family products, ScanExpress Programmer is a tool for all phases of the product life cycle—whether programming early code during product development, programming production code during manufacturing, or reprogramming units out in the field, ScanExpress Programmer is designed to fit all in-system-programming needs. ScanExpress Programmer features support for the most popular in-system programming interfaces and components. Utilizing a high-performance Corelis JTAG controller along with user-friendly and intuitive Windows-based software, ScanExpress Programmer offers fast and convenient erase, program, verify, and read capabilities for all supported programming modules. ScanExpress Programmer modules interface with the UUT using a JTAG controller. The Target Assisted Flash Programmer module takes advantage of a JTAG embedded CPU on a target board to shorten the Flash memory programming time and simplify the operation of Flash programming. Users can perform all the standard Flash programming functions such as erase, blank check, program, verify, obtain device ID, etc, but at real CPU processing speeds. When programming times are of utmost importance, TAFP is the solution of choice. The Target Assisted Flash Programmer module has the ability to test the JTAG connection, test the RAM, check the Flash device ID, erase the Flash device, perform a blank check, download Flash data to RAM, program the Flash device, and verify the Flash data all with a single mouse click. The Target Assisted Flash Programmer module relies on using a supported JTAG compatible CPU device on the target in order to accomplish the Flash programming operation. Please contact Corelis for CPU devices currently supported. 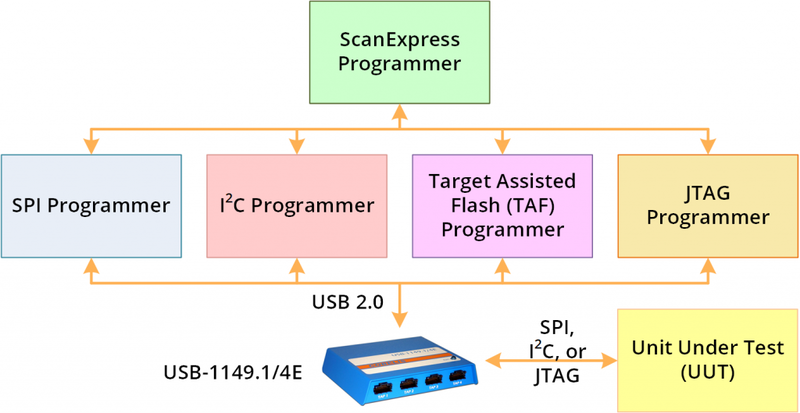 ScanExpress JTAG Programmer features four unique programming modules: JTAG Programmer, SPI Programmer, I2C Programmer, and Target Assisted Flash (TAF) Programmer. See Ordering Information for module licensing options. The JTAG Programmer module is a flexible JTAG/boundary-scan programmer capable of programming Flash memory and serial EEPROM devices connected to boundary-scan components. Boundary-scan Flash programming files are generated by the ScanExpress Flash Generator™ software (sold separately). The JTAG programmer can also program CPLDs, FPGAs, and other JTAG in-system programmable devices. Concurrent programming for up to four boards on supported Corelis JTAG controllers is included for increased throughput. The Serial Peripheral Interface (SPI) and Inter-Integrated Circuit (I2C) Programmer modules offer fast programming of SPI devices and convenient programming of I2C memory devices by controlling the serial bus signals directly through dedicated SPI and I2C interface available on supported Corelis boundary-scan controllers. The Target Assisted Flash Programmer (TAF) module utilizes Corelis’ JTAG Embedded Test (JET) technology to take control of the system CPU for the fastest possible ISP performance with Flash memory devices. Engineers and developers can quickly erase, program, verify, and read code stored in memory devices during the development process. ISP allows memory devices to remain on the shelf in a blank state until ready-to-ship, easing inventory management. Reprogram Flash and troubleshoot firmware problems in the field or on the repair bench using ISP. Save time and effort by performing common programming functions while the target device is installed in-circuit. Decrease complexity by using a single universal instrument for multiple ISP operations. Includes SPI, I2C, and JTAG modules. SPI & I2C serial bus programming. 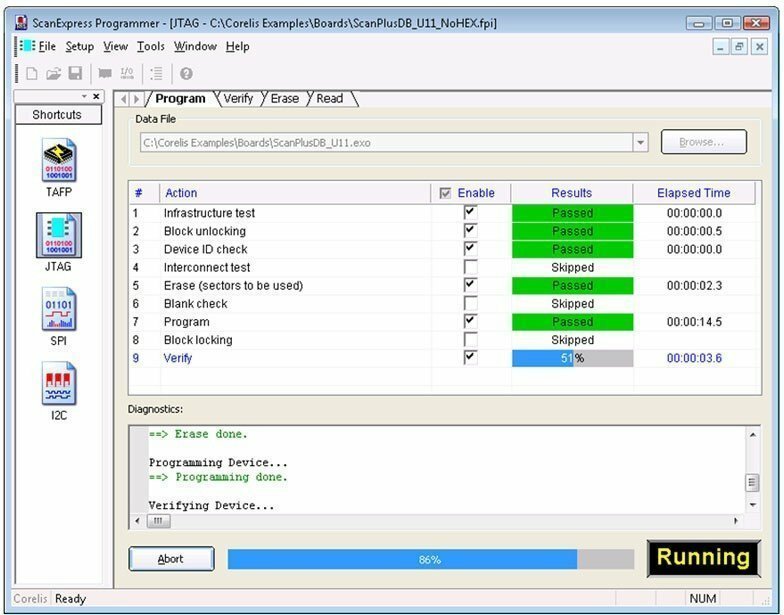 JTAG Flash and CPLD programming. Target Assisted Flash programming. Includes one CPU support package.